Did you know that computer processing is currently the fastest-growing source of energy consumption & waste? In fact, a Harvard University physicist recently estimated that an average Google search consumes enough energy to boil half a kettle of water. Of course, this doesnâ€™t apply to basic, pre-indexed, algorithmically-optimized searches. But it DOES show that computers use a lot more energy that the average person estimates. With rising energy costs and increased demand for computer processing, big businesses are already much too aware of the need to minimize the energy consumption of their computing infrastructure. Sure, thatâ€™s fine for big businesses, but what can the average home user do? 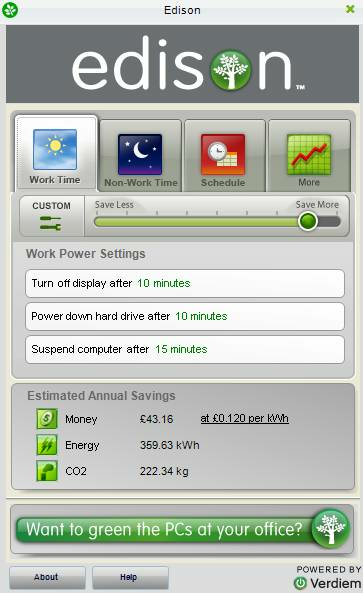 This software allows me to easily tweak a wide range of setting that individually offer very little in terms of energy savings. But when combined in unison, these add up to some substantial positive environmental benefits. Aligning power usage to my work week, so that less energy is used during off hours. Quantifiably measuring how much energy Iâ€™m saving, so that I can set new energy-reduction goals for myselfÂ and even hold contests with friends or other people in my office. Some of the main techniques used for cutting power consumption include turning off displays, powering off hard drives and suspending the operating system at different time intervals… based on scheduled activity patterns. These settings can be manually dialled in one-by-one, orÂ they can be configured in bulk using a simple slide-bar interface. The real power behind Edison is its simplicity. The developers believed that people would get more use out of it if it was low-maintenance and easy-to-understand. Some of the things I like best about Edison are that itâ€™s easy to install, has a simple interface, and mostly runs in the background. This makes it ideal for large team efforts, or for use by non-technical people. If your office has been looking for new ways to become more energy-conscious, this can be a real morale-booster and a fun team-building activity. Verdiemâ€™s ultimate goal is to get just 10% of the planet signed up for their free software. If they were to achieve this goal, it would take the equivalent of 500,000 automobiles off the road. So if youâ€™d like to do your part to help the planet, take a few minutes to set up this free tool. How much is this programme? I want to get one and i need information on where and how to get it, i know the downloads are just trials for free, but i want to get the actual programme.